With my 22-year background as a magician, mystery and illusion are my artistic mediums, and I specialize in creating sensory illusions that point to how dynamic the process of perception truly is. I am fascinated by how illusions can construct reality and hope for my work to highlight astonishing aspects of everyday life while investigating perceptual anomalies and scientific oddities. "I specialize in creating sensory illusions that point to how dynamic the process of perception truly is." Magic relies on the full weight of our sensory experience, both to create its illusions and to have the fullest impact possible, as it is in many fields. I have long been fascinated with turning sensory expectations on audience’s heads, that’s what magic does inherently by creating impossible illusions. Magic embodies this inherent, subconscious deep understanding of perception that we all process. 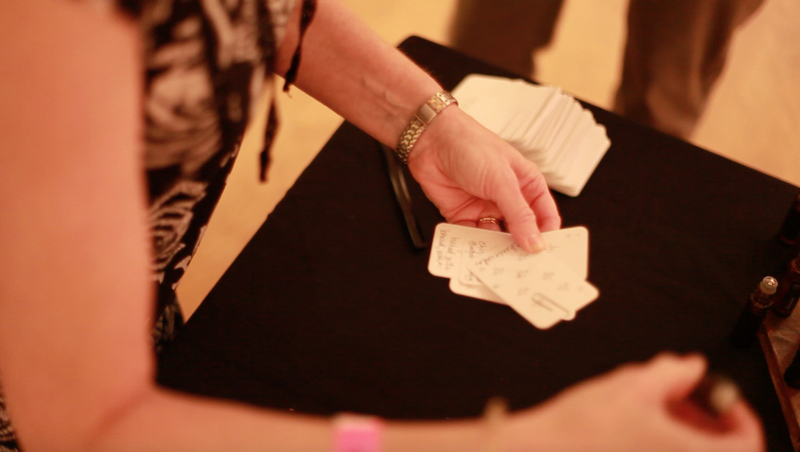 Magic relies on sensory experience: you think you see a card and then it vanishes... but was it even there to begin with? Based on your visual system, you instantly created a series of assumptions about its presence, color, position and shadow. But your other senses help to create this illusion as well, your familiarity with the weight, how it is held, etc. and that allows the magician to defy those expectations. I enjoy finding presentational means that explicitly highlight other aspects of the perceptual process, and joining the two to hopefully create well-rounded narratives that reinterpret how we perceive. "Magic embodies this inherent, subconscious deep understanding of perception that we all process." Typically I am concurrently searching for a story that fits with a theme, often a scientific oddity, perceptual anomaly or lost piece of folklore. I then develop plots to incorporate these ideas, and develop method in brainstorming with mentors and collaborators and through further research. After the concept is complete, I begin designing and creating props, and then move into rehearsals. After further refinement through practice, I traditionally incorporate the piece into smaller scale performances for further development before moving it into my main repertoire. This process is what is typical of my practice, though certainly not a formula or always the norm. Sometimes as the story, the scientific idea comes first and it almost seems like a piece will be built in reverse. The process is always evolving, which I revel in. I know that a magician writing about scent seems a bit unexpected... I began researching smell during an artist’s residency with Escape to Create in Seaside, Florida in 2014. I was initially researching illusions for each of the five senses but kept finding myself being drawn back to scent. I became passionate about working with scent as a medium, as it is perhaps (for the lay public!) our most overlooked sense yet can engage people in a profoundly visceral way. "I was unable to find more than a few examples of magic performed with scent, spanning about 500 years of history." Joining this together with interactive illusions provides an opportunity to explore new areas with my audiences, such as personal memories and stories, concepts in extrasensory perception, and deeply embedded ideas of time and place. Scent excites me, it inspires me. I am in love with its inherently mysterious qualities, shifting ephemeral nature and find it is a great pairing with the also temporal medium of magic. I adore diving into the science, anthropology and the deeply amazing aspects of scent, and bringing these ideas to my audience’s attention. In months of scouring databases, books, and conversations with numerous industry experts, I was unable to find more than a few examples of magic performed with scent, spanning about 500 years of history. This uncharted territory excited me and it is my privilege to work to create pieces that blend these two beautiful concepts. I am thrilled to have further scent-based illusions in development, which will be explored during my Artist-in-Residence term with High Concept Labs in Chicago this fall and a residency with the Institute for Art and Olfaction in Los Angeles this winter, which I could not be more honored or excited about. The museum-goers each remove the half card that was safely stowed in their pocket. And without knowing how they accomplished this impossible feat, they turn it over - finding that it is a perfect match with the chosen piece they hold in their hand...Their blind smell test, a success.